Currently listening to: ‘Perfect World’ – The Ruse. Currently reading: ‘The Bell Jar’ – Sylvia Plath. Today I went into town and I got bought a few items..I was determined to get a new pair of trousers (actually bought two), as I don’t have many in my wardrobe. 1st and 2nd photo (I should invest in a full-length mirror! ): White sheer shirt – Topshop and skinny jeans – Primark. 3rd photo: Polka-dot peep toe pumps – Accessorize. 4th photo: Camel brogues – Primark. 5th photo: Scarf – Primark. 6th photo: Shirt – Topshop. 7th photo: Super skinny jeans – River Island. 8th photo: Satchel – Accessorize. It is amazing how cheap Primark is – I got the shoes, scarf, jeans plus two sets of clothes hangers all for £27. Although some people complain about the quality of Primark’s products I have never had a problem with anything I have purchased from the store. Of course the quality isn’t going to be that of Topshop or River Island but you get what you pay for. I am currently wearing the polka-dot peep toes from Accessorize and they are so comfy. I can’t wait for summer and these will be fabulous for that season. I have already planned my outfit for tomorrow’s class – my outfit in the 1st photo worn with the polka-dot peep toes plus the satchel bag from Accessorize. What have YOU bought recently?.. 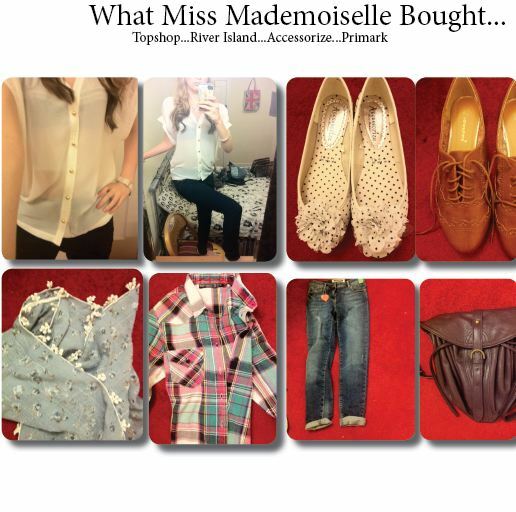 This entry was posted in Fashion, Personal and tagged Accessorize, Primark, River Island, Topshop, Twitter. Bookmark the permalink.